COACH & CAR PARKING: In National Trust free car park at start. The car park is open all year, gardens, refreshments and toilets open from March-December. From the car park, and opposite the entrance to the car park, walk ahead eastwards through metal gate onto farm track with Restricted Byeway sign on left and continue up hill on wide track through a further gate heading towards telephone transmitter aerials. At fork in bridleway take the right fork and continue keeping the masts on your left whilst admiring the view on your right, follow bridleway round to the left to pass transmitter station to lane. Q1. On the large memorial stone what year is E''R ? Go straight over lane and continue between hedges following overhead power line.Continue on left hand side of field towards two radio masts. At end of field bear left and drop down through small culvert passing through gate and continue down through field keeping left of a very large Oak tree. Go through hunting gate and bear left diagonally across lane and continue up hill on track with two masts on right. 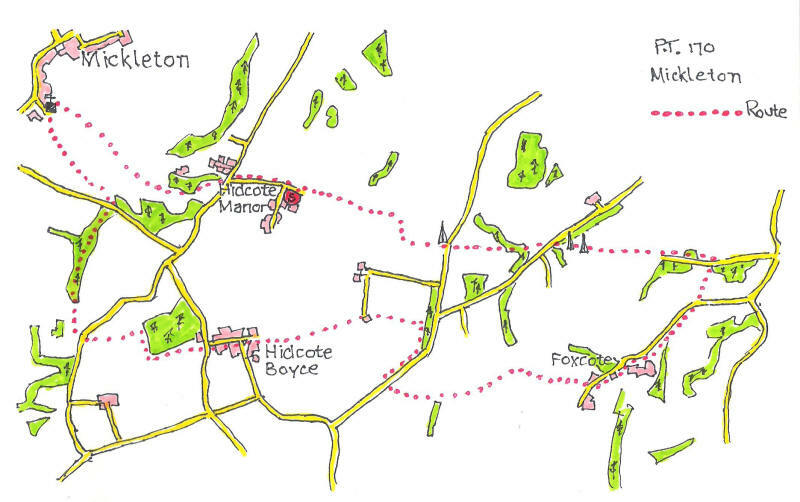 Continue ahead and after appx 1km after short descent you will see the village of ILMINGTON down on the left hand side. Just before metal gates across track, turn right on track, and drop down between wire fences to reach a tarmac driveway. Turn right and continue over cattle grid passing Foxcote Mansion on your left with black metal fence. Continue on track down hill passing house on left and climb a small hill to pass a larger house on right. Just after this house turn right through gate and follow blue arrow to climb ahead up hill towards gate. Go through gate with yellow marker and continue between fences then wall on left to T junction, turn left on track ahead on path on left hand side of fields, and at end of hedge on left ahead across field to gate and farm track. Turn right and continue on track to reach lane. Turn right on lane and follow round to the left and at junction where main road bears round to the right turn sharp left over stile. Follow path keeping dry stone wall on right to gate, go ahead to marker post and bear left following white marker arrows over hummocky ground to pass through metal gate and continue towards village in distance on clearly defined footpath. Ahead through gate and descend on track to join tarmac road passing farm buildings on right to reach telephone box on left and post box in wall on right. Q2. What is the post box number? Continue ahead through village to T- junction. Continue straight over main road on footpath through metal gate and ahead on well defined footpath and at next gateway turn right and continue on right hand side of field keeping hedge on right. In 100m turn left and follow field round keeping field on your left and hedge on right but look out for gap in hedge to turn right crossing wooden bridge over small stream and continue ahead into next field keeping hedge on left to reach farm track, cross over and with barn and disused building on left turn immediately right on footpath signed “Heart of England Way”. Keep hedge on right and field on left proceed through gap in hedgerow on clearly defined path through woodlands with open fields beyond fence on right eventually emerging onto left hand side of field with woodlands on the left. In approx. 50m, turn left through gate, and descend down steps to reach road. Cross road and follow footpath “Heart of England Way” descending down hill across field adjacent to small copse on right. Continue straight ahead through gate on left hand side, turn right keeping to the right hand side of the field, ahead towards the church at bottom of field in corner. Through gate and continue on footpath through copse emerging into a small field, continue straight ahead in the direction of the church spire passing walled graveyard on the right through gate, down slope towards the church. Q3. What is the name of the large house on the left of the footpath junction? Turn right on footpath/bridleway to gate ahead with another grave yard on left. Through gate and walk ahead 28m to corner of wall on right, cross meadow 110m to a go through a concealed kissing gate in hedge, ahead across field to cross stile with yellow footpath arrow and continue up hill across field. Cross further stile and continue up hill, at top bear right in the direction of the yellow arrow keeping small copse of conifer trees on left, continue on footpath on ridge of field heading for woods to gateway. Ahead on bridle track and continue steeply uphill towards stone wall with stone pillars and balls. Turn right through blue gate, cross road and ahead on lane opposite sign posted "Hidcote Manor Gardens" continue on lane to the car park, and end of walk.